One minute it’s back-to-school season and the next minute it’s Thanksgiving. And before you know it, Chanukah somehow manages to peek its’ face around the corner. Thankfully, winter hasn’t shown its’ chilly face. I’d like to keep it that way. As soon as I came to my senses and realized that Chanukah is just a few days away, aside from the quick and dirty job of scouring Amazon for presents, I started my latke brainstorming. My husband suggested I do a basic potato latke. After I gave him the stink eye for that zany suggestion, I got to work. 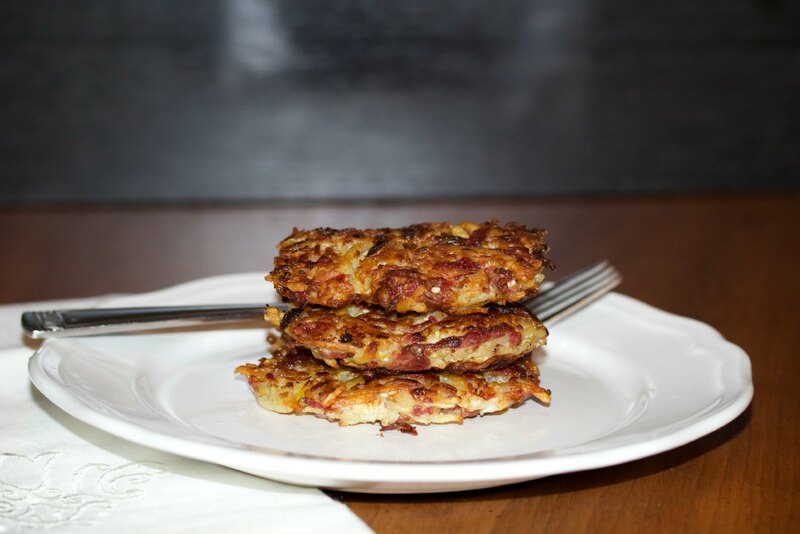 I’ve got a few new latke flavors for you to feast on this season and I hope you enjoy them. The first latke of this Chanukah season is kind of a marriage of St. Patrick’s Day and Chanukah. 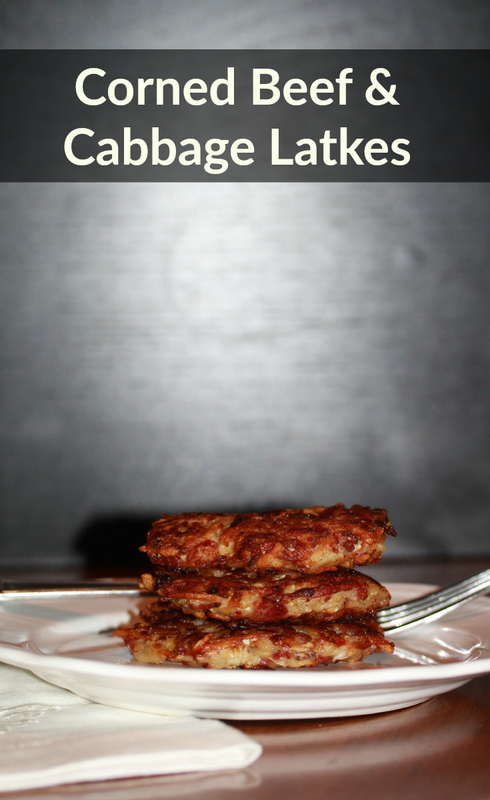 I’m bringing you some Cabbage and Corned Beef Latkes. I know that St. Patty’s Day is a few months away and in no way connected with the history of Chanukah, but I had the flavors stuck in my head. It occurred to me that it just might work. And it did! I quickly ran out to my local kosher deli to pick up the best and fattiest corned beef they had on hand. 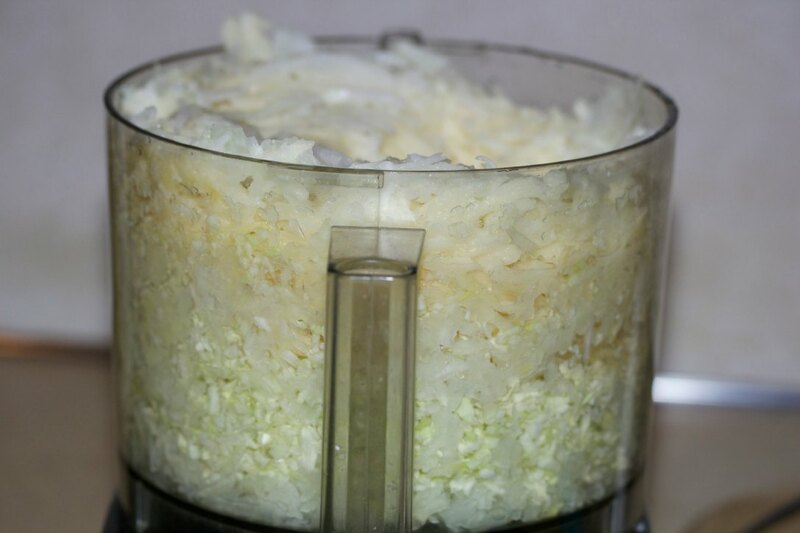 I shredded up some onions, cabbage and potato in the food processor, making sure to squeeze out all of the extra starchy liquid when done. 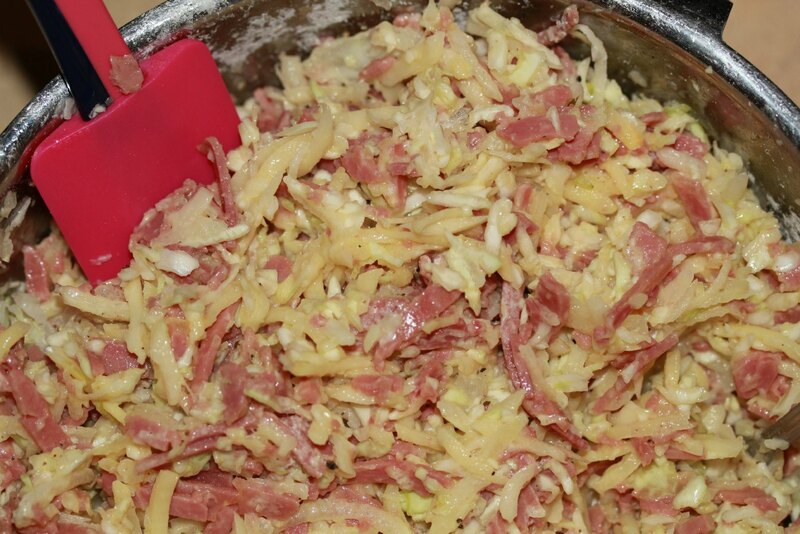 I then shredded up the corned beef with a knife and then mixed it into the cabbage and onion mixture. I stirred in some eggs and flour. I then formed the mixture into latke patties and fried until crispy and browned all over. I drained the finished latkes on a cooling rack. Of course I snuck a latke or two before serving them. I had to! I recommend serving the latkes with a creamy horseradish sauce – also known as horsey sauce. You need to make these though. They are amazing. Especially when the corned beef gets a bit charred and crispy. Brings out the flavor. Anyways – just make them! If corned beef isn’t your thing, maybe you’d enjoy some wild mushroom and roasted garlic latkes or maybe carrot ginger latkes are more your speed. 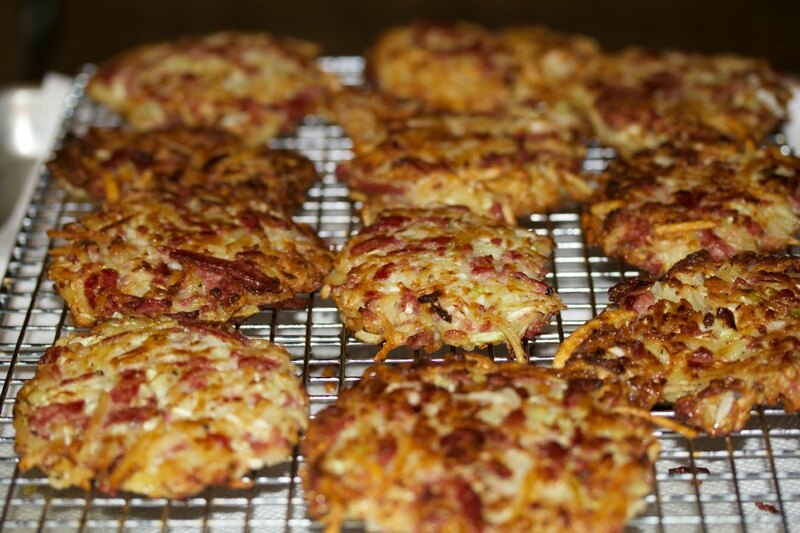 Whatever floats your boat, get into the holiday spirit and enjoy it with latkes! 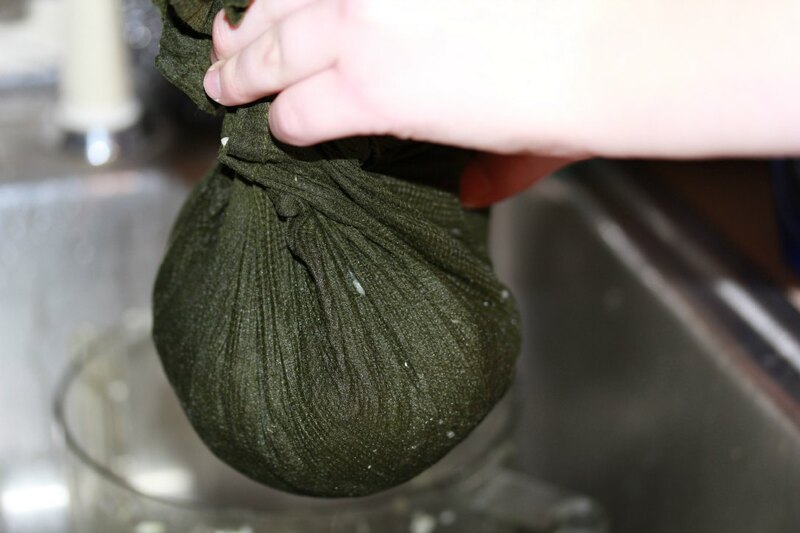 Place the shredded mixture in a towel and carefully squeeze out as much of the starchy liquid as possible. Transfer the mixture to a mixing bowl. 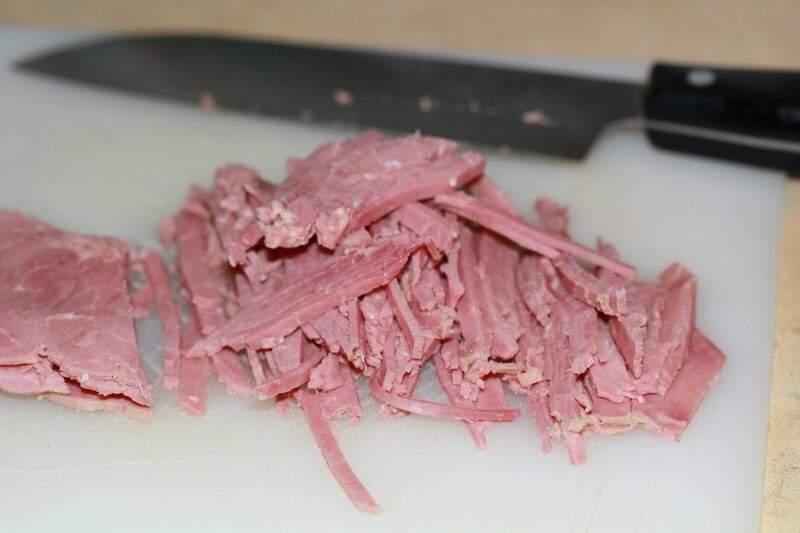 Shred up the corned beef with a knife. Add it to the mixing bowl. Stir in eggs, flour, salt and pepper. Heat up a large fry pan on medium-high heat. Add in the vegetable oil and let the oil heat up. 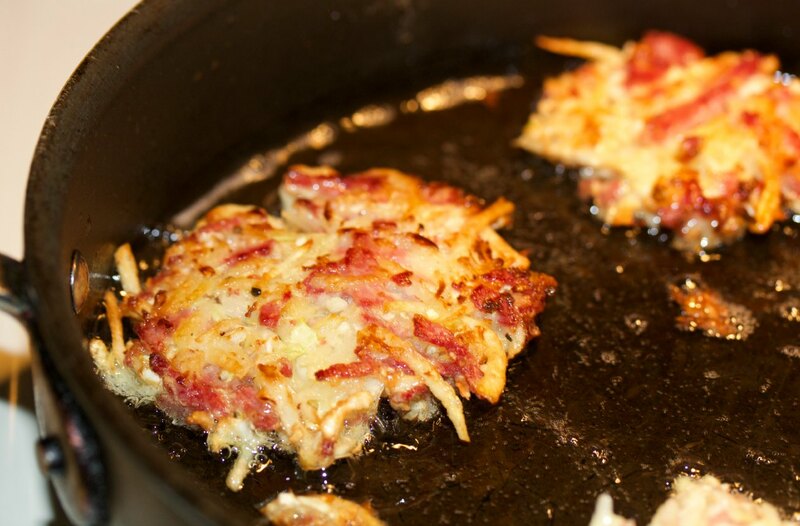 Form the latke mixture in to patties and fry on medium-high heat until brown around the edges. Flip and continue to fry until browned on both sides. Drain a paper towel lined cooling rack.